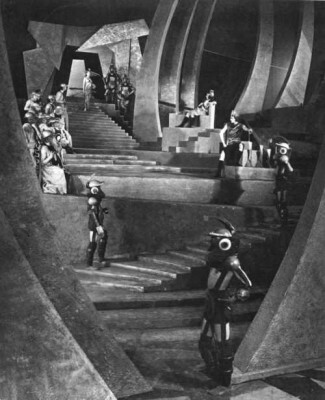 For years the famous Russian science fiction film Aelita (Аэли́та, 1924) was difficult to see. The Soviet government frowned on its lazy polemics, and most in the west were aware of the film only through a handful of extremely tantalizing stills showcasing the picture's striking constructivist sets and costumes. Finally though, Aelita (here called Aelita, The Queen of Mars on the box but not the movie) did appear, in a 1991 Kino International VHS release. My memory is a little hazy, but I'm pretty certain it was released to laserdisc soon after, which is how I remember pal Charlie Ziarko and I watching it a year or two after that. Like many others who'd waited years to see it, we were dazzled by the Mars sets and costumes, but notably underwhelmed by everything else. Nonetheless, more than 20 years later, I was anxious to see Flicker Alley's new manufactured-on-demand DVD of Aelita, hoping that on my large (90-inch) screen and with a good video transfer that I might, perhaps, be more impressed. Alas, the movie is no better and, worse, the video transfer is the same analogue one from the early 1990s, complete with Kino International's logo at the head. The film elements are in good shape, and the transfer is quite good by early ‘90s standards, but definitely lags way beyond technologically from what it could be. Produced by David Shepard's Blackhawk Films/Film Preservation Associates, it's presumably identical to that earlier version, as well as Image Entertainment's out-of-print pressed DVD from 1999, so if you don't already own a copy, it's still worth experiencing once. (I've not seen the RUSCICO version, released to DVD in 2004, which is seven minutes shorter, though perhaps not missing any footage if transferred at a different frames-per-second rate.) The David Shepard version features a piano score by Alexander Rannie, which adapts themes by Prokofiev. The sometimes-confusing story begins in 1921, three years before the film was released, and as Andrew J. Horton points out in his thoughtful essay about the film's politics, "Science Fiction of the Domestic: Iakov Protazanov's Aelita," means that it takes place during Lenin's New Economic Policy period, when the Communist government dabbled with small-scale capitalism in an effort to boost Russia's postwar economy. The plot has Los (here called Loss, played by Nikolai Tsereteli), a bourgeois scientist, one of dozens from all over the world baffled by a mysterious, indecipherable radio message apparently sent from Mars. (This is the same premise, more or less, as the later iron curtain sci-fi epic First Spaceship on Venus.) He dreams of Mars's queen, Aelita (Yuliya Solntseva), daughter of the planet's totalitarian ruler, Tuskub (Konstantin Eggert), while she, armed with a new telescope, is equally fascinated by and increasingly fixated by him. Eventually Los, accompanied by Red Army soldier Gusev (Nikolai Batalov) and stowaway Kavtsev, land a rocketship on Mars, where Los and Aelita are united while Gusev leads the imprisoned working class in an anti-monarchist revolution. At nearly two hours, Aelita, while not exactly boring, works up a lot of energy for not a lot of fire. As Horton points out in his essay, the Los character, a bourgeois specialist who struggles with the New Order but returns home to embrace it, is a surrogate for both director Protazanov and the author of the original story, Alexi Tolstoy, a relative of Leo. Still, the main reason to watch the film is the genuinely arresting sets and costume designs by painter-designer Aleksandra Ekster (1882-1949). The costumes particularly are totally alien in appearance yet quite beautiful and strangely, almost indescribably logical, though probably wildly impractical in terms of actually wearing them while, say, doing the laundry. Search images under her name and you'll find many of her designs (a treat especially when seen in color) for other media are along much the same lines as those that appear in the film. 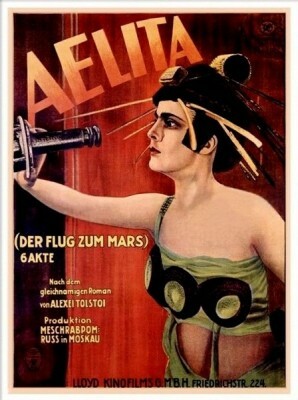 In terms of plotting, though, Aelita really is not all that different from low-budget American sci-fi pictures from the 1950s, particularly Flight to Mars (1951), which resembles it to the point of having a character named "Alita." As noted above, Aelita is presented in a state-of-the-early-1990s-art transfer that's okay for what it is but very disappointing by 2015 standards, more so by ‘90s video-supering of titles and translations and a general approach toward silent film presentation that has changed a surprising degree in the last quarter-century. On the plus side, the film is presented at the correct viewing speed, and sources generally good-looking elements for a 90-year-old film. The audio on this region-free disc is also fine, and the intertitles (English only, with no other subtitle options) are good. No Extra Features. Definitely worth seeing once but not quite the masterpiece many thought it was, Aelita is Recommended. * Perhaps not coincidentally, the same name as Ed Begley, Jr.'s character on TV's St. Elsewhere.